Some trips, you never know who you’ll meet, what type of invitations you’ll receive or what restaurants you feel like experiencing. 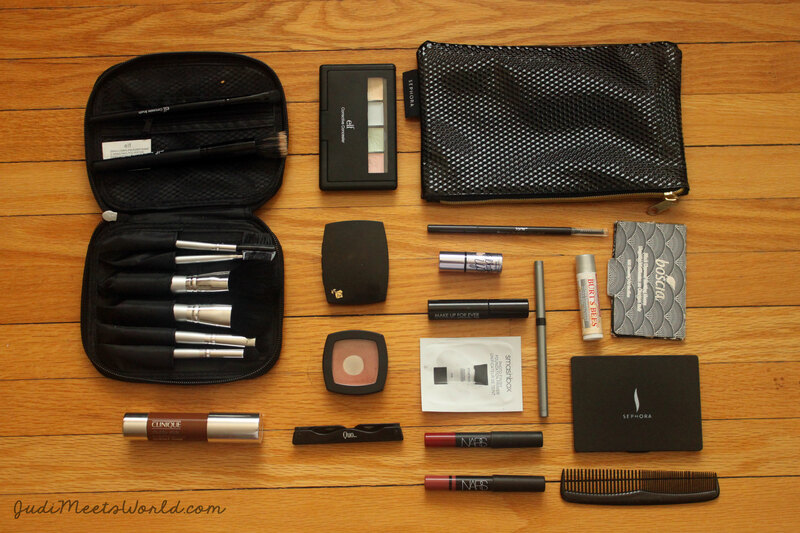 I always make sure to pack my essential cosmetics to go from a casual make-up free day trip to an evening soiree. Here’s my list of how I stay prepared for whatever my travel adventures bring my way. TIP: Shopping at Sephora online gives you access to free samples (3 per order) as well as bonus codes for other samples. These are perfect travel-sized companions – and I’m pretty sure a good majority of the items on my list today are samples I’ve stocked from Sephora, a few weeks before my trip. You can also go into a Sephora and ask for sample sizes of your favourite products, especially liquids, to make sure you have an under-100mL size of your must-haves if you’re traveling by air. Let’s begin! Links provided below for products featured. My most recent purchase of travel brushes are a steal at $18.00 US for the 6-piece Travel Brush Collection from E.L.F. Cosmetics. Foundation, blush, concealer, and eye makeup brushes. I like to throw in an original beautyblender sponge or beautyblender‘s micro.mini sponges for good measure. As for the travel bag, you can buy these anywhere…or redeem a code from Sephora that comes with a cosmetic bag. I’ve never paid for any of my cosmetic bags! Going with the classic Smashbox Photo Finish Foundation Primer – you can see above that I used a sample sized one. It’s flat so it’s easy to store and add to my liquids bag for airport screening. A little goes a long way. Believe it or not, that sample size was good for a 4-day trip to New York! A cream concealer saves me from having to add it to my liquids bag. I chose this E.L.F. Cosmetics Studio Corrective Concealer palette for $3.00 US. That’s not a typo. It’s not the greatest concealer, but it does wonders for a trip out of town. My CC Cream has SPF in it to make my skin look great and keep it protected from the sun. I choose a CC Cream because it’s not as heavy as foundation. My product isn’t a part of this photo, but I use bareMinerals‘ Complexion Rescue Tinted Hydrating Gel Cream. Again, I chose to go with a pencil solid so I didn’t have to add it to my liquids bag. Pictured is tarte‘s Amazonian Clay Waterproof Brow Pencil which as a spooly at the end for easy shaping and blending. It also is super skinny and fits well into my makeup case. Find neutrals that are easy to blend – you can easily give yourself a day or evening look with different combinations. Pictured is a palette I got as a sample from an Estee Lauder bonus. Samples. I can’t stress this enough. Pictured is Makeup For Ever‘s Smoky Extravagant Mascara. Sample size of Benefit‘s Watts Up cream-to-powder highlighter and a full size of Clinique‘s Chubby Stick Sculpting Contour. Going with a full-sized Arbonne‘s mineral powder brush. Classic Burt’s Bees‘ lip balm and sample sized Nars‘s Lip Pencils (one daytime and evening colour). Can’t forget the boscia blotting linens for a day of exploring in the sun and heat, a small comb, and an eyelash/eye brow tool. I love this Quo Brow & Lash Definer. Not pictured is my make-up spray. I use a sample size of Urban Decay‘s De-Slick Oil Control makeup setting/finishing spray. I pack beautyblender‘s solid cleanser. Easy to pack, no fuss at the airport. That’s it! My go-to grab bag of cosmetics that assure me that I’ll be ready for all types of impromptu events from city exploring and hiking to grabbing brunch with friends to a surprise fine-dining experience. 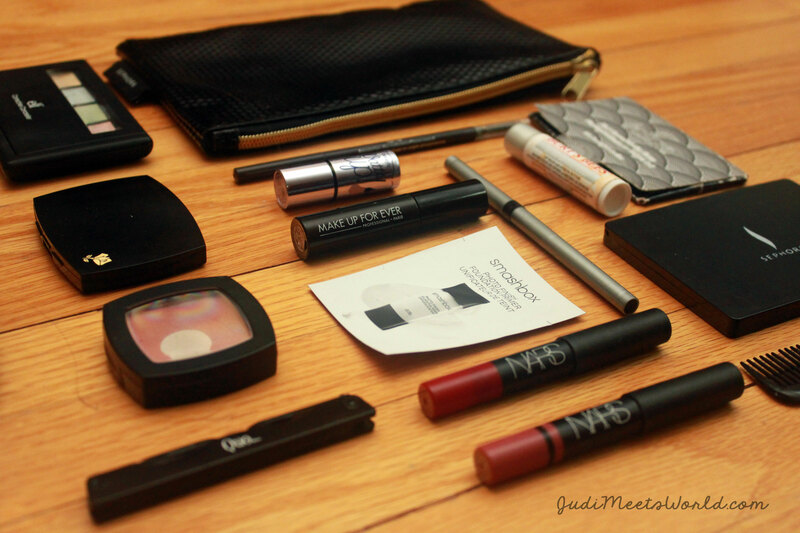 What’s in your cosmetic travel bag? Meet Puktien Cabana Beach Resort. Meet Le Germain Hotel Calgary.